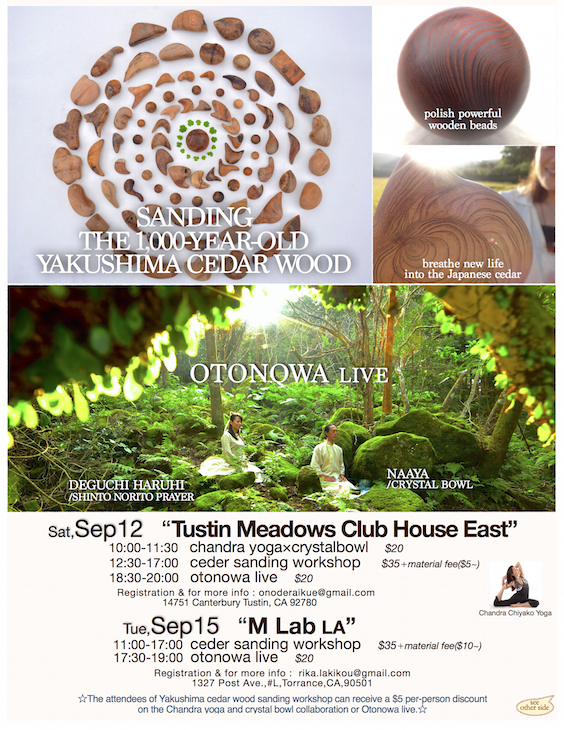 ☆The attendees of Yakushima cedar wood sanding workshop can receive a $5 per-person discount on the Otonowa live.Please bring your own yoga mat. "Polishing of Yaku-cedar (Japanese cedar from Yakushima)"
On the planet earth, which is part of the magnificent universe, Japanese cedars in Yakushima have been living with the immense energy of the universe for thousands of years. They spread their roots wide in crystal forest witnessing transitions of all of the ages. 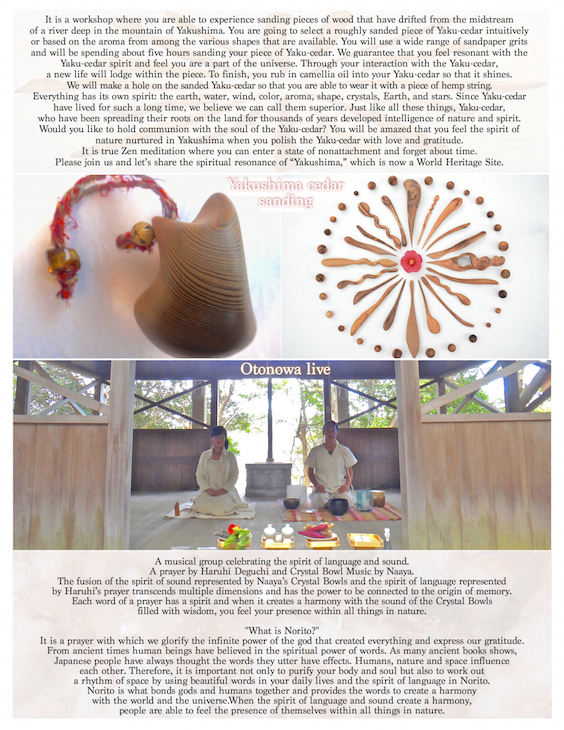 It is a workshop where you are able to experience polishing pieces of wood that have drifted from the midstream of a river deep in the mountain of Yaku-cedar. You are going to select a roughly polished piece of Yaku-cedar intuitively or based on the aroma from among the various shapes that are available. You will use a wide range of sandpaper grits and will be spending about five hours polishing your piece of Yaku-cedar. We guarantee that you feel resonant with the Yaku-cedar spirit and feel you are a part of the universe. Through your interaction with the Yaku-cedar, a new life will lodge within the piece. To finish, you rub in camellia oil into your Yaku-cedar so that it shines. We will make a hole on the polished Yaku-cedar so that you are able to wear it with a piece of hemp string. 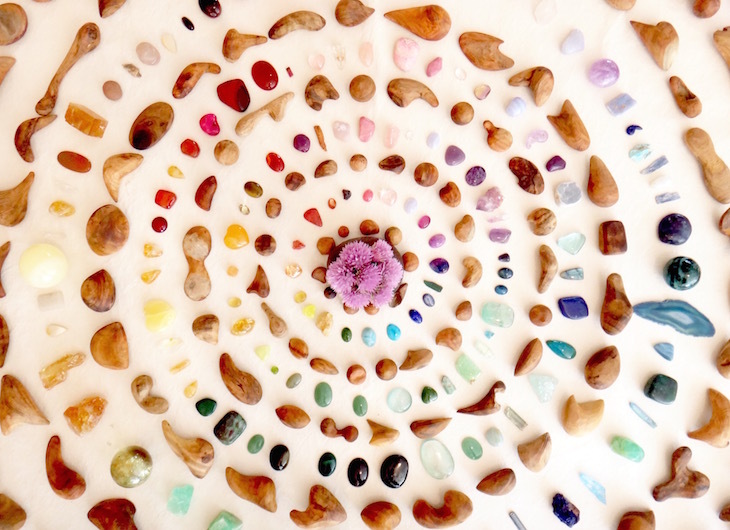 Everything has its own spirit: the earth, water, wind, color, aroma, shape, crystals, Earth, and stars. Since Yaku-cedar have lived for such a long time, we believe we can call them superior. Just like all these things, Yaku-cedar, who have been spreading their roots on the land for thousands of years developed intelligence of nature and spirit. Would you like to hold communion with the soul of the Yaku-cedar? 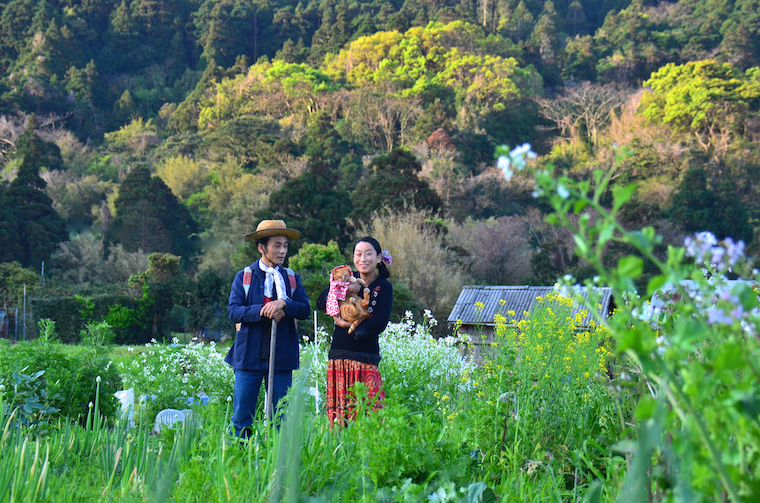 You will be amazed that you feel the spirit of nature nurtured in Yakushima when you polish the Yaku-cedar with love and gratitude. It is true Zen meditation where you can enter a state of nonattachment and forget about time. Yakushima has been designated as a World Heritage site. Yaku-cedar, Japanese cedar trees, have more than one thousand growth rings, which reminds us of how old they are. In this workshop, you will be polishing driftwood pieces of Yaku-cedar. You will be astonished by how shiny they are after polishing. 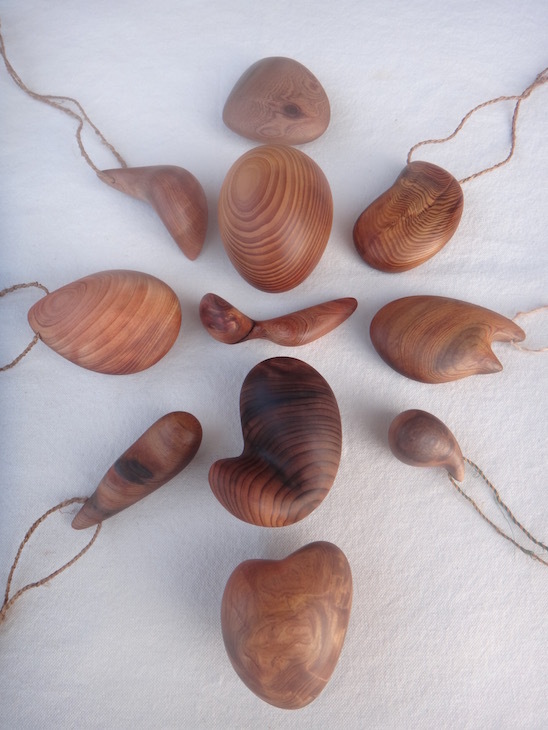 The polished Yaku-cedar can be used as a decoration for your room or you can even wear it in your hair or as a necklace. When the spirit of language and sound create a harmony, people are able to feel the presence of themselves within all things in nature. 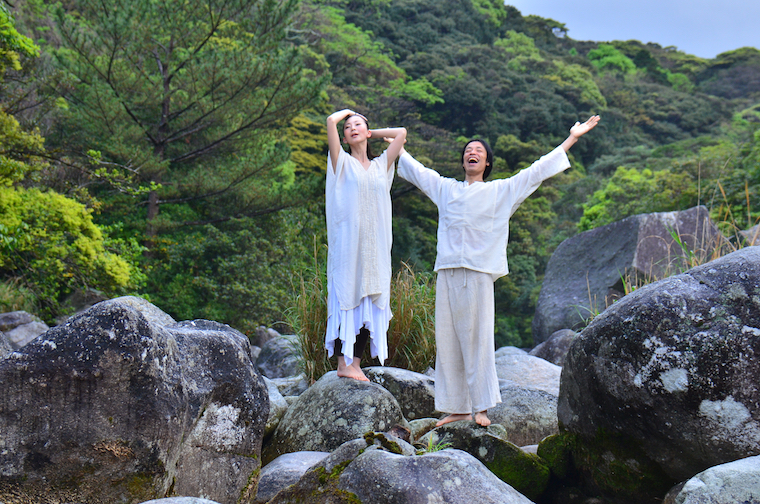 Please join us and let’s share the spiritual resonance of “Yakushima,” which is now a World Heritage Site. The fusion of the spirit of sound represented by Naaya’s Crystal Bowls and the spirit of language represented by Haruhi’s prayer transcends multiple dimensions and has the power to be connected to the origin of memory. Each word of a prayer has a spirit and when it creates a harmony with the sound of the Crystal Bowls filled with wisdom, you feel your presence within all things in nature. It is a prayer with which we glorify the infinite power of the god that created everything and express our gratitude. From ancient times human beings have believed in the spiritual power of words. As many ancient books shows, Japanese people have always thought the words they utter have effects. Humans, nature and space influence each other. Therefore, it is important not only to purify your body and soul but also to work out a rhythm of space by using beautiful words in your daily lives and the spirit of language in Norito. Norito is what bonds gods and humans together and provides the words to create a harmony with the world and the universe. She is the great-great-granddaughter of Onisaburo Deguchi and she lectures on prayers that surpass religious sects. She spoke at Jeju Heiwa-sai in 2014 and at the Anniversary of Onisaburo and OSHO. She formed a group called “Otonowa” with the Crystal Bowl Musician, Naaya since 2014 and she has been doing performances where people can feel the miraculous power of language. 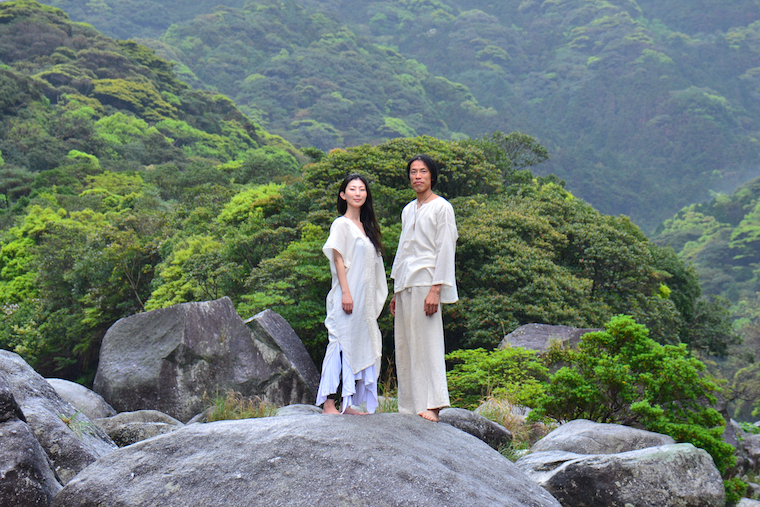 He has been creating harmonies with the sounds of crystal ever since he encountered the crystal of Yakushima in 2007 by a fortunate turn of fate. The “sound” is fused with the sounds that you cannot hear and resonates with the vibration of space, the earth, and living things. It reverberates in your heart and body like a spectacular and magnificent symphony. In the activity where guests polish pieces of Yaku-cedar driftwood that are more than a thousand years old, Naaya delivers the aroma of cedar, the shape created by nature, and the energy of wood. 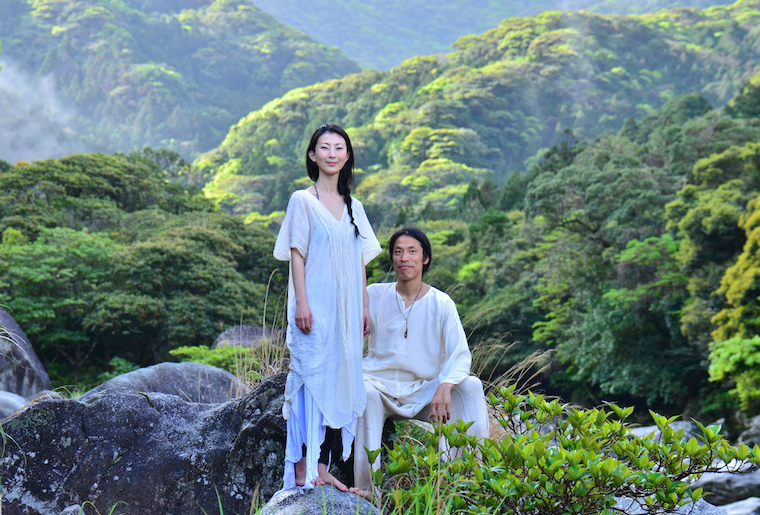 He is also a leader of “Kaiho-ya” which organizes retreat tours in Yakushima where the guests can feel released and harmonize with the spirit of nature, planet earth, and the universe. 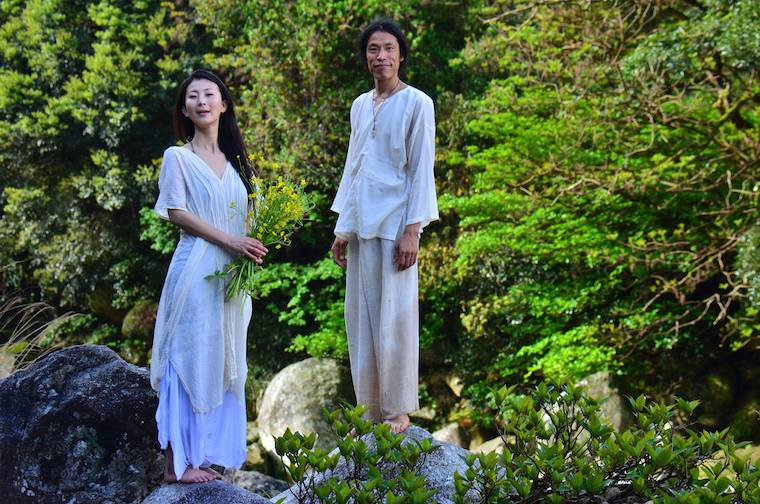 Naaya is a performer of Crystal Bowl Music who lives in Yakushima. He holds events where he plays Crystal Bowls and promotes mental concentration by polishing driftwood pieces of Yaku-cedar. He worked at events held in South Korea and L.A. Crystal Bowls are made from melted natural crystal. Therefore the sound of Crystal Bowls flows smoothly like water and sounds like our planet Earth. The sound is refreshing like the green of a forest and solid like the earth. 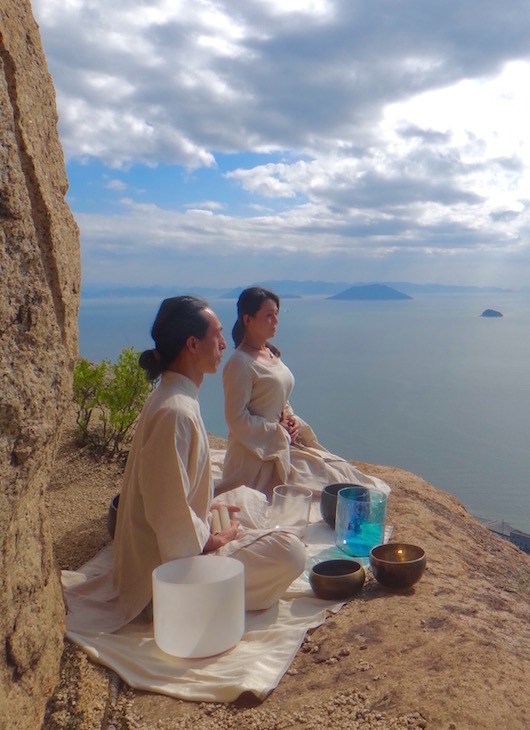 With the sound of the Buddhist Singing Bowl (Orin) and an ancient bell, it can create a true synchronized harmony. The harmonic tone that resonates in the space reaches out to everyone’s’ soul and each individual cell and your body will move in concert with the energy of the crystal. The sounds including the sounds from the land or artificial objects, the sounds that you can hear, the sounds that you cannot hear and the sounds that you feel are all alive. The sounds that you generate yourself are nurtured with these various sounds and become a prayer that will travel through the universe. When your body, heart and soul create a harmony with the sound of crystal you feel you are connected to all the things that are part of the magnificent universe. We invite you to feel and enjoy the performance. We are looking forward to sharing the time and space with you! 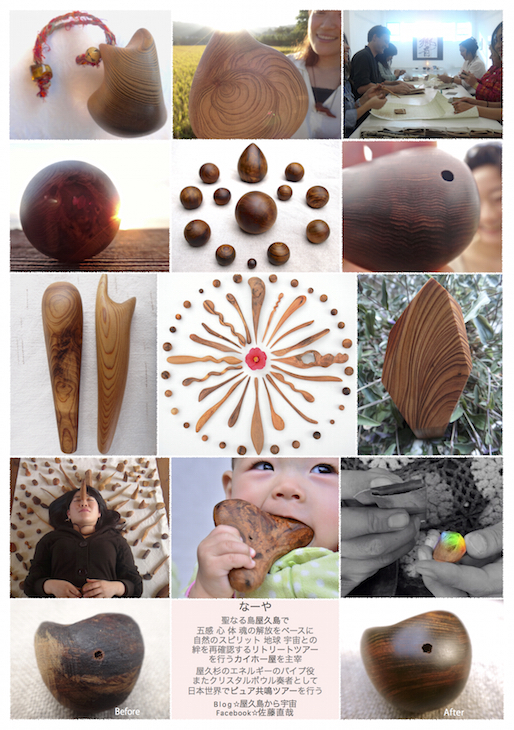 One of my friends living in Yakushima, a beautiful crystal island in Japan, is making a peace-ball from driftwood from Yakusugi. He said something good on his blog, and I wanted to introduce it here. “At first, they are rough but as I polish them they become shiny and smooth like a stone. Because I'm polishing them everyday, I often think about 'polishing'. I polish them by sandpaper, but actually I'm just scratching them. They go through from a big scratch to a medium scratch, to a small scratch, then finaly they become shiny. I apply this process to the life. A shocking event that may have happened in your childhood can leave a big scar in your heart. 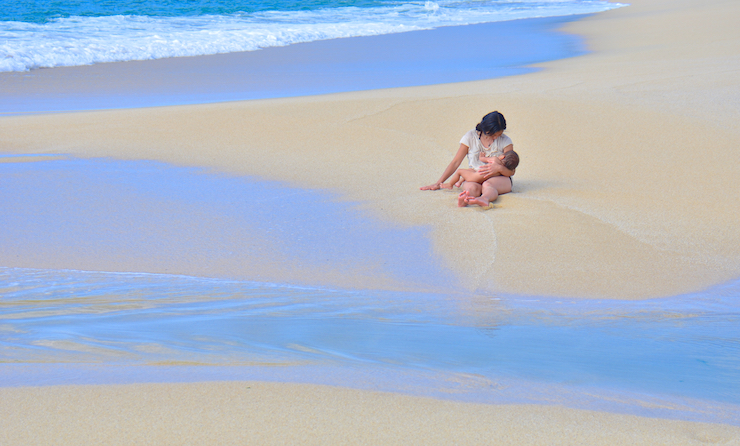 Many of the traumas occur in your chilhood, don't they? Polishing is also the same, there are big scratches at first. As you grown up, you will get nerves to spare, so you have less chance to get hurt so deeply. But still, you will encounter some shocking events or sad things in various situations, and get other scars. In polishing, I keep scratching them till the very end, but they become shiny. I think the life is similar to this. When you get hurt from something, you might think that you have to heal it. But that scar also could be a necessary process to develop your soul or to lead your soul to the enlightment. Maybe the trauma that your inner-child has is the same, it doesn't need to heal but to be accepted. Once your soul is aware of the scar, the soul will follow the pathway to the light, with or without healing the scar. Of course it might be shocking when you get hurt, but I think there is no good or bad emotions. Norito are the ancient prayers or sacraments of Shinto worshipers in Japan, recited in praise to a deity and the infinite divine energy of the universe. The verses bring purification of the body, mind and soul, and align the rhythm of energy of this world. The efficacy of prayer is founded on the concept of koto-dama, the spiritual power that resides in words. According to ancient beliefs, both in the east and the west, elegant, articulate speech brings about good, whereas ugly, coarse language can summon evil. Some of the ancient phrases demonstrating faith have been found written in the oldest existing collections of Japanese myths and poetry, such as "Kojiki" and "Manyousyu." Phrases such as “Kotodamano sakiwau kuni” and “Kotodamano tasukuru kuni” are references to some of Japan's earliest history. Humans, nature and the universe are all reflected in each other. Cloudiness and confusion in our minds cause disharmony in the world of nature and space. It is important to value the use of beautiful language in our daily life. 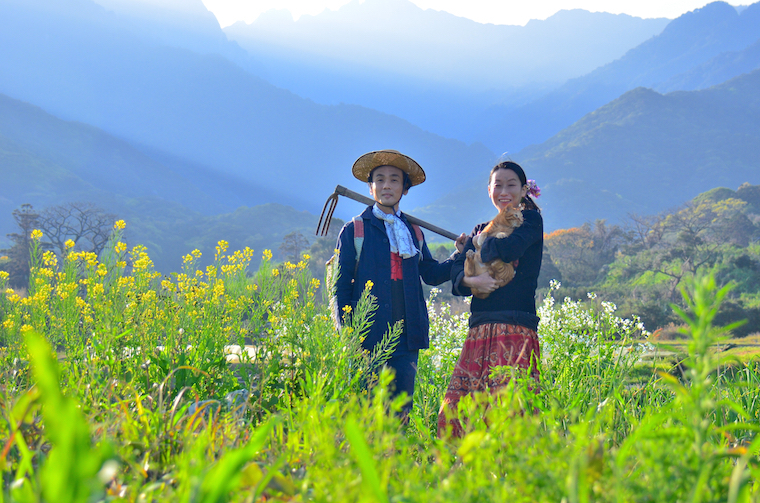 Norito are expressions that help to expand our awareness of the divine and have psychological and spiritual power that help bring a harmonious balance of our world and the macro cosmos. copyright © 2015 屋久島「カイホー屋」 all rights reserved.